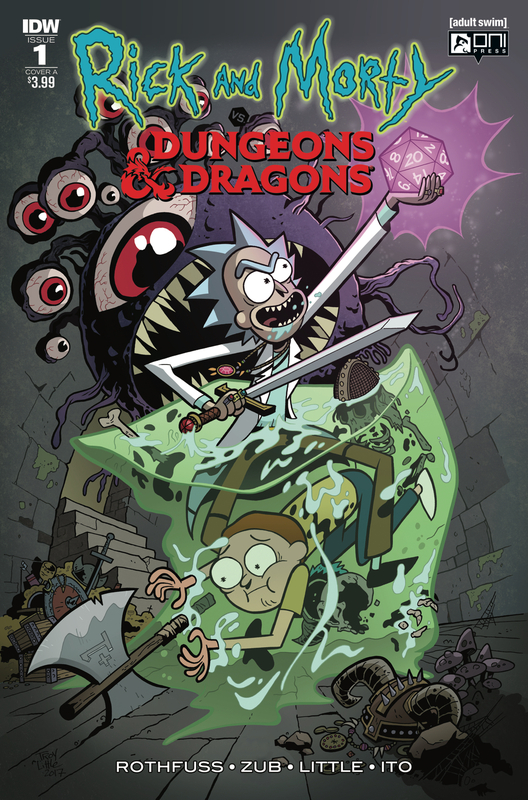 While you’re waiting for the long-awaited fourth season of “Rick and Morty” or for your next D&D session, give yourself the gift of Rick and Morty vs. Dungeons & Dragons. Released as a four-part comic book miniseries by IDW and Oni Press, the entire series is now available in a collected edition, complete with the series many amazing variant covers. 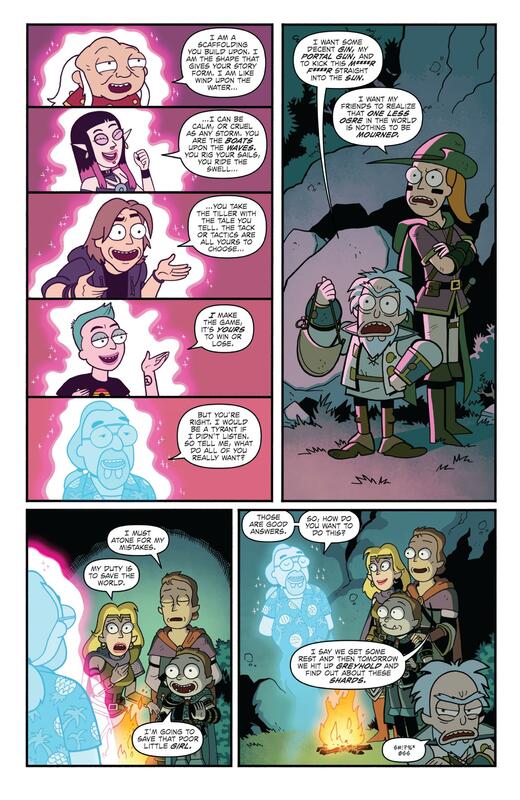 The basic story is this: Morty discovers everyone at school is playing D&D. He goes to the local game shop and meets a pretty girl, Annika, who invites him to a D&D game. It turns out Morty has no idea how to play. Rick nows everything about D&D, so the mad scientist takes it upon himself to teach him. Things start with an actual 1st edition game, but then Rick concocts technological and interdimensional schemes to teach him later editions. It culminates in a universe-hopping escapade to a realm that replicates 5th edition D&D and the entire Smith family joins in on the adventure. I could literally hear the voice actors reading the lines in my head. It was that dead-to-rights good. The characterization is perfect (Jerry is hapless until he takes on a half-elf with +2 charisma, Rick is a jerk, Morty is constantly lost until he pulls his “every 10th adventure” card), and the D&D love is thick. If it seems like a combination that won’t work, give it a chance. It’s truly beautiful. And just when you think the characters won’t make any progress (it’s slow and incremental on the show), it’s a D&D adventure that finally brings them all together and gives a hint at their humanity. Troy Little’s art is also fantastic, feeling very true to the show’s style while also mixing in a load of fantasy goodness. There are also numerous visual gags including references to D&D, the show and other pop culture. Like how Rick’s gnome bard plays an Eddie Van Halen-style lute. Or how the cast of the ’83 cartoon series appears in several panels. Or how various D&D celebrities such as Matt Mercer, Satine Phoenix and Gary Gygax make appearances. Little shines when he takes the group to a full-formed fantasy world, and the Rick and Morty characters begin to embody their D&D characters. In addition to the collected issues, the book features every single variant cover (there were many) with which the single issues were published. There’s also a brief interview with Little, Zub and Rothfuss about their history with D&D and how they approached the series. 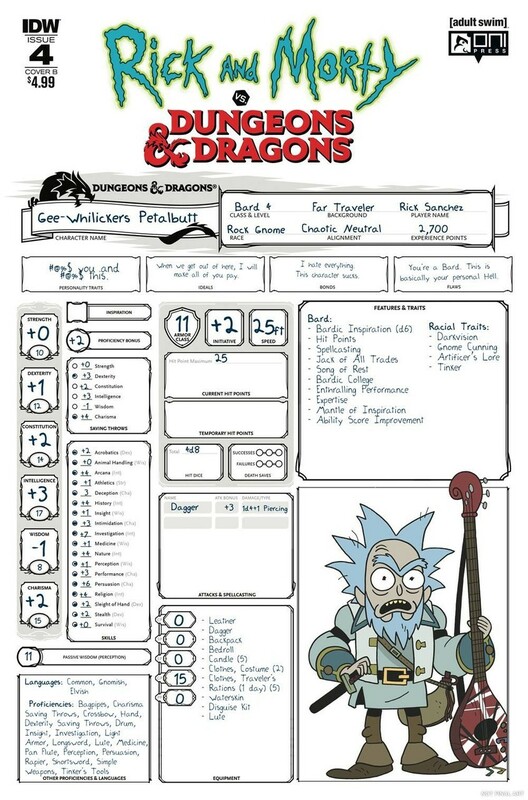 My only wish is that there was more Rick and Morty-style D&D content. The single issues were published with character sheets styled after their characters from the comics, and it’s fun stuff that you could use for your game. With these sorts of comics, I always hope for an encounter or monster or something else from the book. (Each issue of Dynamite’s Pathfinder series features an encounter and a gridded battle map based on that issue.) That lack of much of that content here isn’t a complaint so much as something I’d just love to see. There’s lots to love in this book, whether you’re a fan of the show or of the RPG. And if you’re a fan of both? You’re in for a real treat. Get Rick and Morty vs. Dungeons & Dragons on Amazon.